From the author of the bestselling Basic Training for Trainers comes this lively, inventive collection of instructional aids that are perfect for developing abilities in communication, teamwork, perception skills, and more. Simulations, role-plays, and exercises can be dramatically enhanced using these games. 40 illustrations. 100 ways to dramatically enhance training. New Ideas­­AAA of Stress Management­­Brainstorm­­Shuffling Papers­­Overcoming Fear­­These are the names of just a few of the 100 reproducible games you'll find in this lively, inventive collection of instructional aids from the best-selling training author Gary Kroehnert. Perfect for developing employees' abilities in communication, teamwork, initiative, stress and time management, creativity, and more,100 Training Gamesmakes role plays more effective, simulations more realistic, and exercises more fun! Each game is self-contained and provides all the necessary instructions and materials. 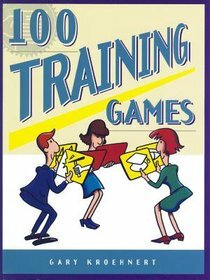 What's more, a unique index grid and system of graphic symbols help you locate and choose complementary games and respond confidently to particular training needs and situations.100 Training Gamesis a must-have sourcebook for trainers and managers in all functions and industries.